When you take a peek into our fridge, one food that you’ll always find is Greek yogurt. At the minimum you’ll find at least 2 tubs of FAGE Total Greek yogurt in there at a time. We go through a lot of yogurt in our house! 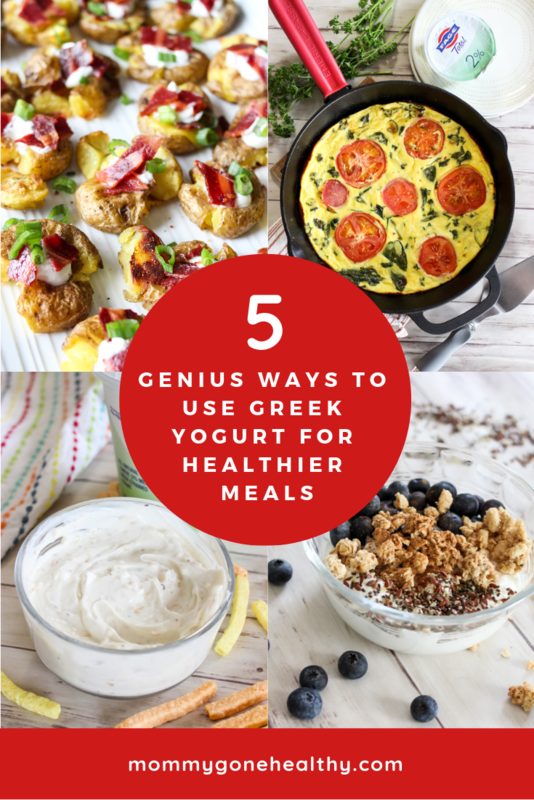 Aside from an awesome snack option, Greek yogurt is super versatile when it comes to all styles of cooking and types of meals. 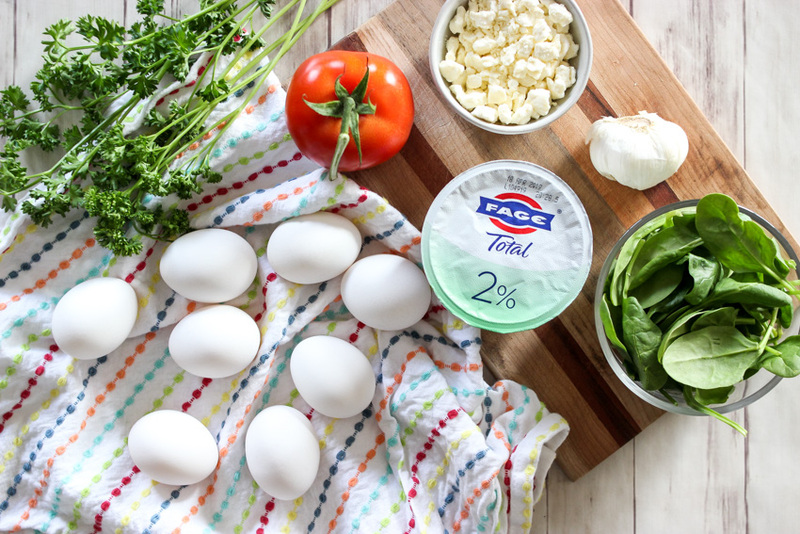 Greek yogurt is often a great substitute for higher calorie and fat ingredients allowing you to make everyday meals healthier, plus it can add amazing flavor to your meals. 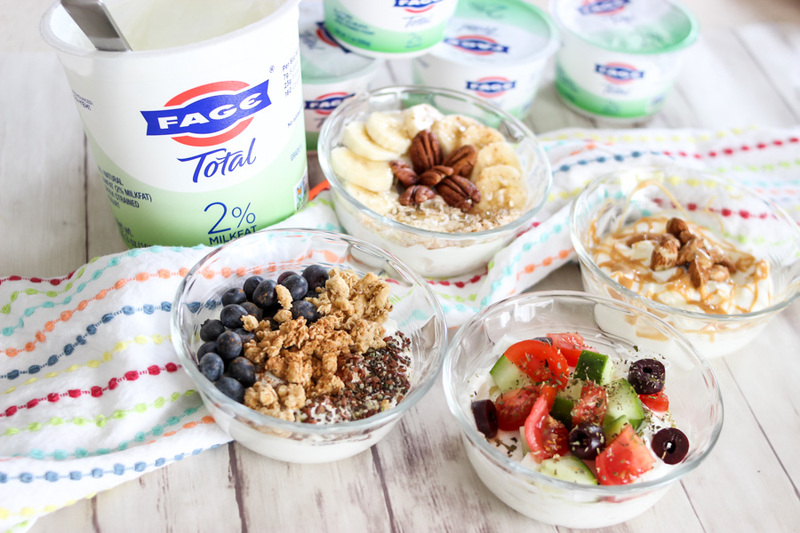 One of my favorite brands is FAGE as it’s hands down the most rich, creamy and oh-so-delicious tasting Greek yogurt there is (seriously, nothing compares!)! 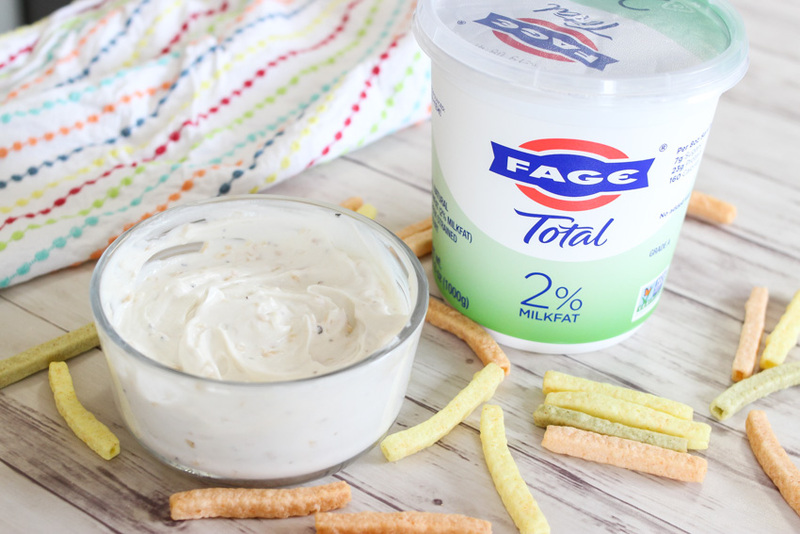 We most often buy FAGE Total 2% Greek yogurt as it’s a favorite amongst everyone in our house. I absolutely love that it’s an all-natural Greek yogurt that’s made with only milk and live action yogurt cultures. Added bonus: no added sugar (only contains naturally occurring milk sugar) and it’s a great protein-rich addition. My kids are obsessed with having yogurt bowls as a “fancy” breakfast or healthier dessert option, while I love using it as a substitute when baking and cooking as a healthier alternative. 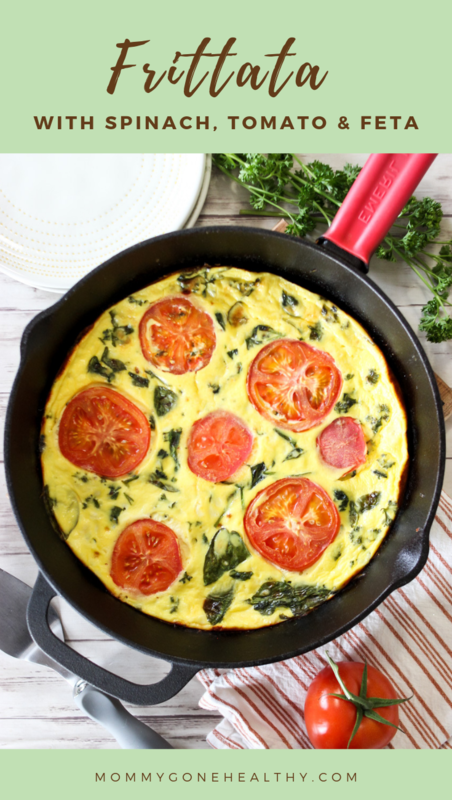 I recently found a new way of cooking with it to make the most mind-blowing frittatas! I’m sharing the recipe below so make sure to save it! 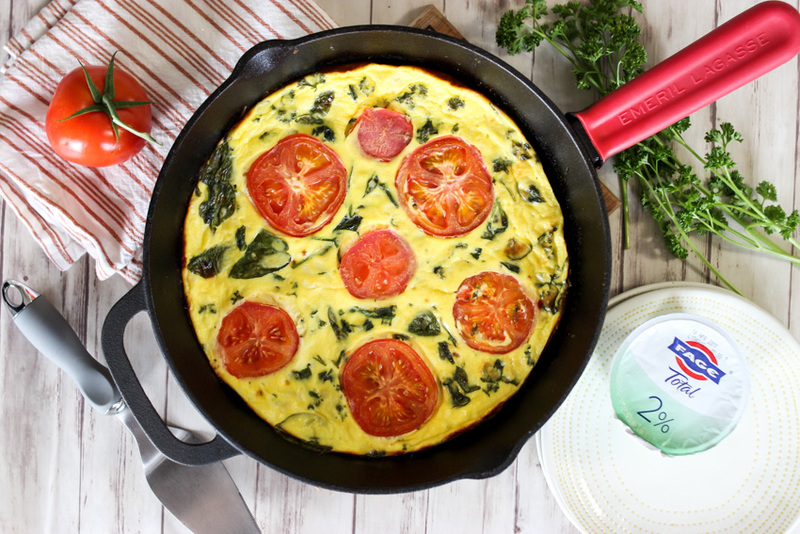 This spinach, tomato and feta Frittata that is made with the addition of FAGE Total 2% Greek yogurt is a family favorite! This dish looks so complicated and decadent, but is ridiculously easy and SO delicious! 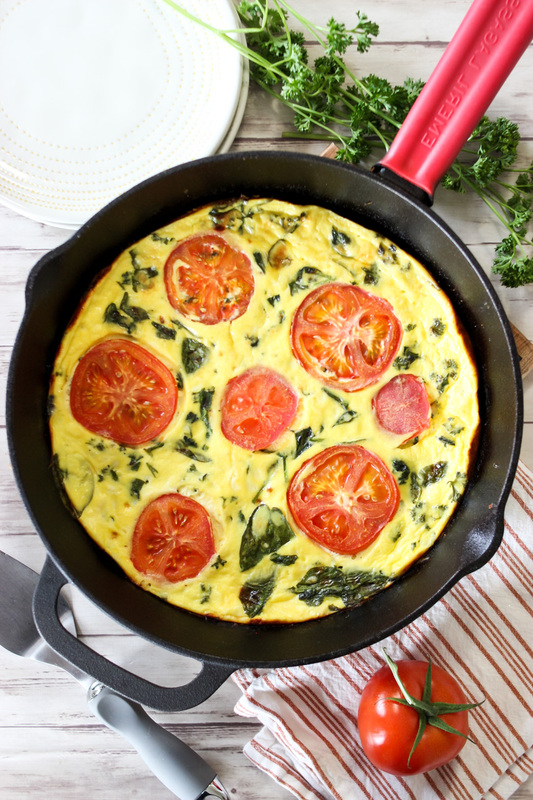 I love making frittatas as they are a great quick breakfast or brunch option that is loaded with protein, lots of veggies and is super filling. They can easily be prepared ahead of time and reheat so well (they even taste great when served cold). If the veggies listed in the recipe aren’t your favorite, they can easily be swapped out or substituted with others. 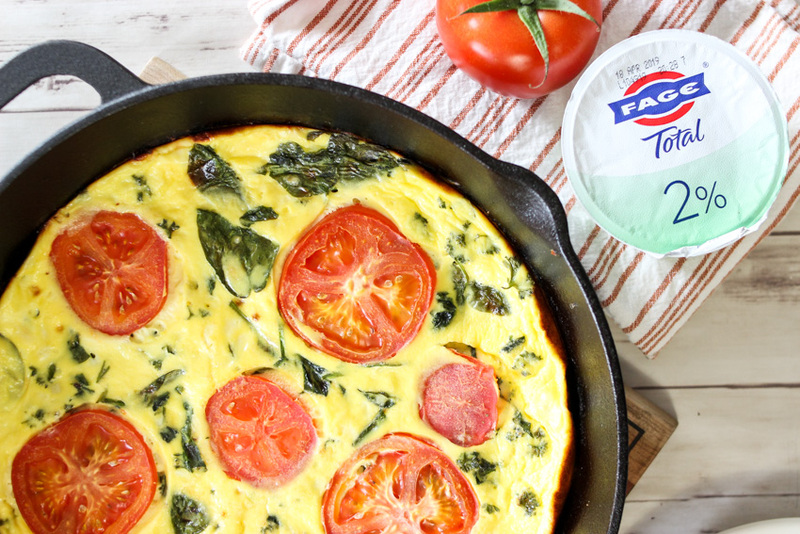 The addition of FAGE Total 2% Greek yogurt is a foolproof way to guarantee a creamy and delicious texture for your frittata. 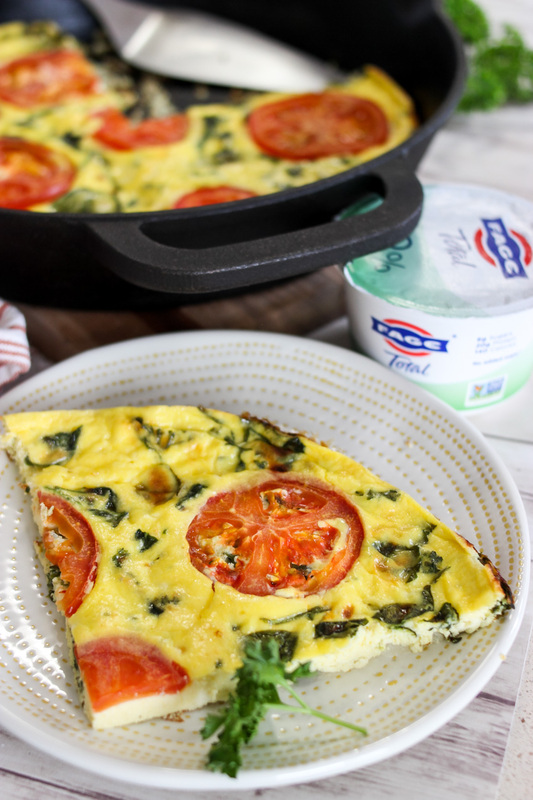 Too often frittatas can become rubbery or tough if not cooked correctly, but the Greek yogurt adds plenty of moisture and a creaminess that allows frittatas to have a fluffier texture and rich taste. Another bonus: an extra punch of protein too! Most dip recipes call for heavy sour cream or mayo, but Greek yogurt can be a great substitute for a much lighter recipe. 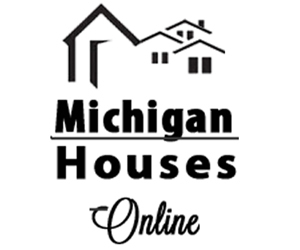 You can substitute Greek yogurt in the same proportion as sour cream for most recipes without a noticeable difference. This recipe for Healthier French Onion Dip is one of our family favorites! Yogurt bowls are constantly on rotation at our house! They make a perfect snack, breakfast, quick lunch or even a wonderful wholesome and nutrient-packed dessert. 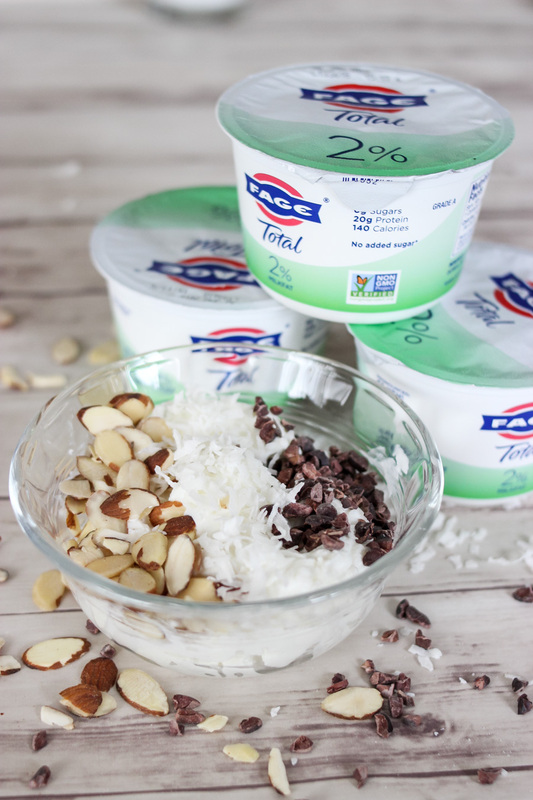 I love adding lots of fun mix-ins to switch it up, ranging from fruits, nuts, and chocolate and they blend in so good with thick and creamy FAGE Total Greek yogurt. You can even make savory bowls with lots of fresh veggies and splashes of balsamic vinegar. For lots of great yogurt bowls ideas and mix-ins check out this post of 5 Extraordinary Yogurt Bowls You’ll Love! One of my fav food substitutions is using Greek yogurt instead of sour cream! I pretty much do it anytime that I can. They are both creamy, offer a great tart kick and are satisfying, but Greek yogurt is such a healthier, lower fat and calorie option in comparison to sour cream. 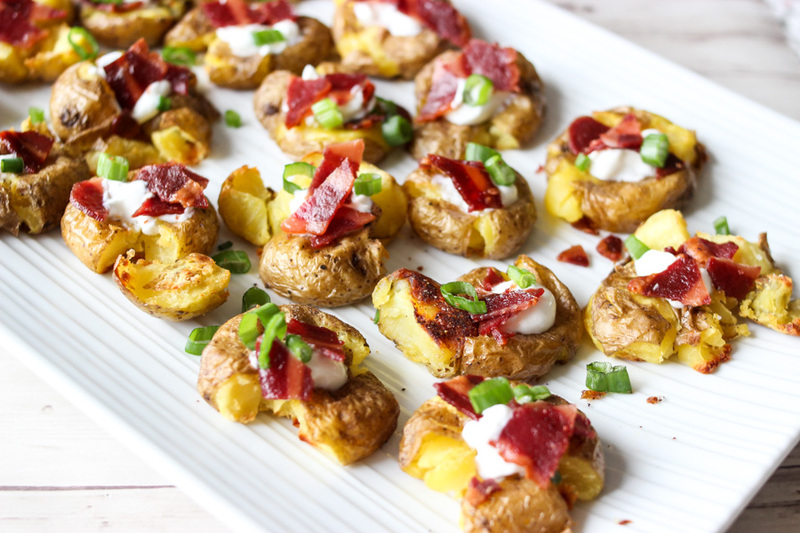 I especially love using it on top of baked potatoes or these super crispy and addictive loaded smashed potatoes. 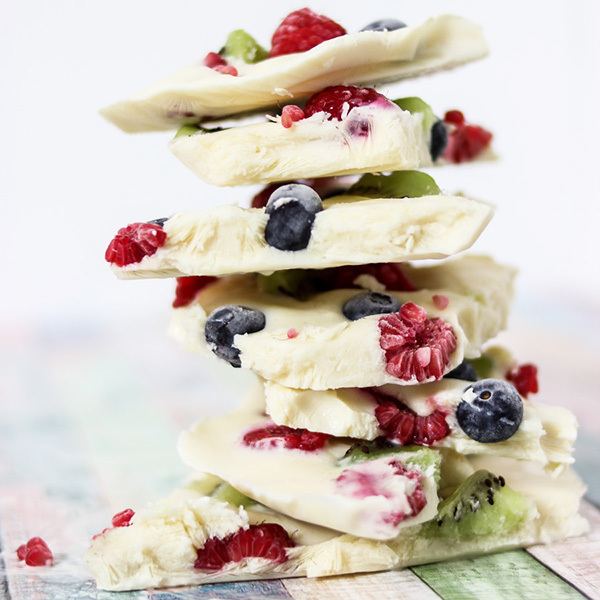 While we’re all pretty familiar with frozen yogurt, frozen yogurt bark is another sweet treat option! Simply spread a thick layer of FAGE Total 2% Greek yogurt on a baking sheet (covered with parchment paper) and top with fresh fruit and freeze for several hours. Remove from the freezer and break into bite sized chunks. Serve immediately! What’s your favorite way to eat Greek yogurt? Do you use it in cooking often? 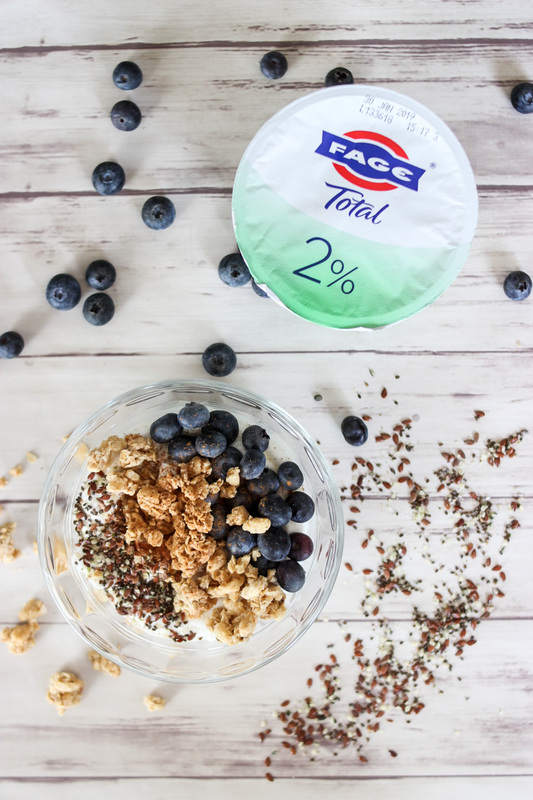 For lots of great recipes and additional ways to use FAGE Total 2% Greek yogurt, check out all the great recipes posted on FAGE’s website. I love these ideas! This post could’ve been written for me! I’m going to try yogurt bark, it looks delicious! 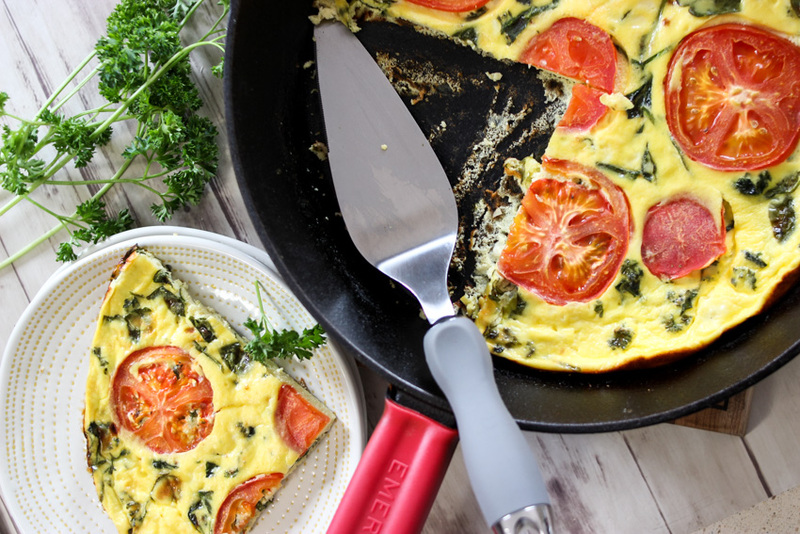 Oh I love the idea of using Greek yogurt in these ways, especially that yummy looking frittata! 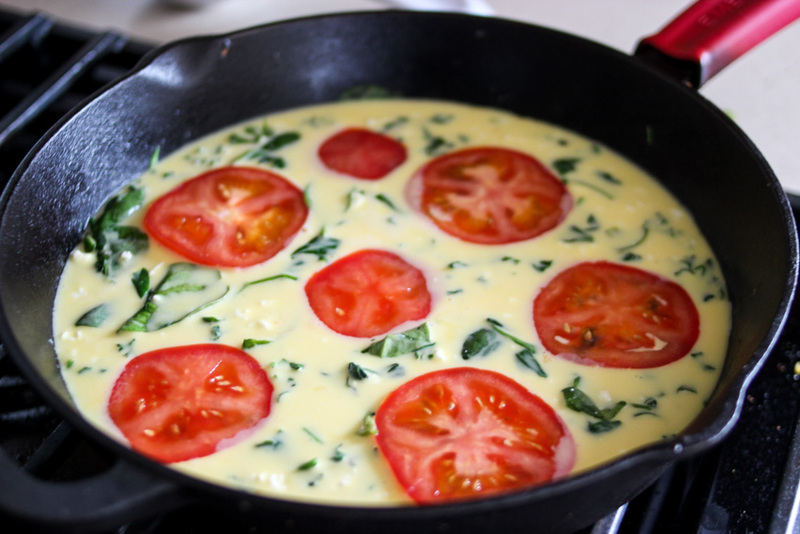 Great dishes to incorporate yogurt! I love Faga, and I love these dishes! These are all such great ideas! 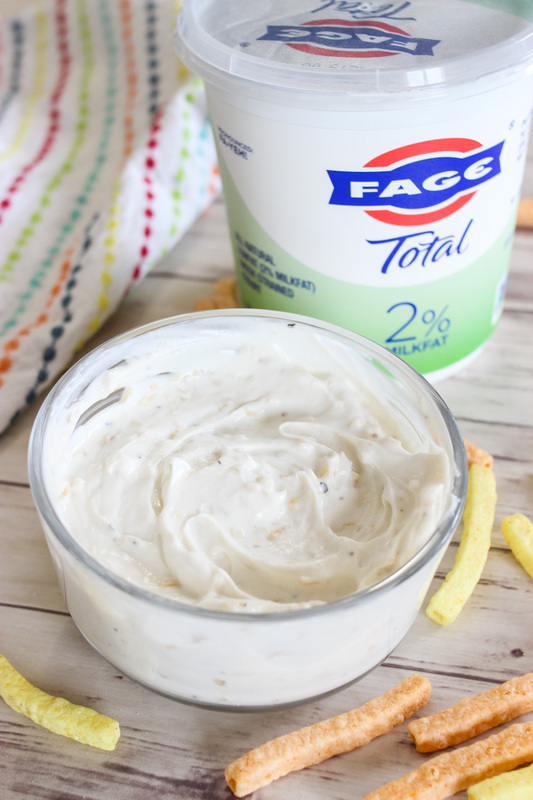 I am a huge fan of Fage yogurt, so I can’t wait to try some of these! !